Chef Rogan Lechthaler is as creative in the kitchen as he is adept on skis. Over 12 years, the Weston, Vermont native has honed his eclectic culinary skills everywhere from Boston to Mississippi and now specializes in using local, seasonal ingredients. The chef started his career in 1999 at The Ritz Carlton in Boston, before moving to Mistral, a see-and-be-seen restaurant in Boston\'s South End. In 2004, he returned to the Green Mountains for a job at Warren\'s Relais & Châteaux Pitcher Inn. During this time, he began wooing his Mississippi-bred wife, and later left for jobs at Blackberry Farm in Walland, TN and L&M\'s Salumeria in Oxford, MS. He was called back to Vermont in 2007, taking a Head Chef position at Stratton Mountain\'s Verdé. 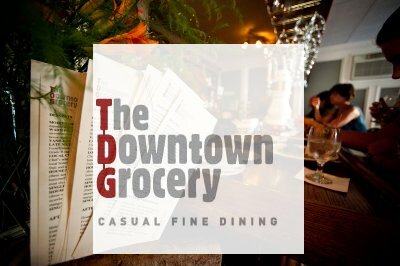 And, in November of 2010, Rogan and his wife, Abby, bought The Downtown Grocery (formerly Cappuccino\'s) near Okemo Mountain in Ludlow. The chef makes his own pastas, sources fresh, sustainable seafood and cures his own meats in the cellar beneath his inaugural casual fine-dining eatery. His seasonal, regional cooking has been featured in The Wall Street Journal, GQ, Yankee Magazine & Outside Magazine. He's also cooked at a private dinner party with Ashley Judd & Morgan Freeman, at an Ambassado.